When you think about innovation, Canada may not be the first country that comes to mind. 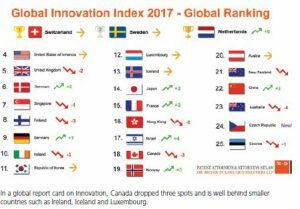 After all, in the 2017 Global Innovation Index survey, Canada only ranked 18th on innovation out of 100 countries surveyed. And while we are underperforming in this area, innovation matters to Canada. It is a key pillar in diversification from a resource economy. Given that, it’s instructive to look at what Canada has gotten right, and where it needs to improve. Canada has many strengths when it comes to innovation. We have sophisticated financial markets with a strong banking and regulatory environment. Starting up a company in Canada is relatively easy. We have several top universities that give us access to much of the talent we need to foster and grow innovation. We have federal and regional grant programs to help companies in the early stages to develop their offerings, as well as research tax credits to offset innovative research and development (R&D) costs. The R&D spending of Canadian corporations is half the level of our U.S. counterparts, and below the OECD average. While part of this is driven by the fact that many Canadian corporations are subsidiaries of U.S. companies, with products developed elsewhere, we have also not seen R&D benefits from favourable tax policies for Canadian corporations to do more research. Perhaps the answer is to look at Israel, which has a strong track record of commercializing academic research. Our research institutions, teaching hospitals and universities produce world-class science. Rather than expecting corporations to perform the research, maybe we should be asking them to help prioritize and subsequently commercialize it. At the other end of the spectrum, many Canadian startups sell too early, or fail to thrive. While it is common around the world for startups to fail, with roughly one in 10 thriving, Canadian startups particularly struggle to access the capital they need to continue to innovate and grow. As a result, a lot of Canadians are building companies in Silicon Valley instead of here. According to the Conference Board of Canada, Canada ranks 13th out of 16 countries on innovation, and 15th on venture-capital (VC) funding. U.S. venture firms invest twice as much into startups compared to their Canadian counterparts. Canadian startup companies need to compete in the U.S. market to thrive and generally they are competing against companies with deeper war chests for sales and marketing. Many companies choose to sell at early stages as the lack of capital makes going it alone too risky a venture. This approach sub-optimizes the opportunity for Canada. The majority of purchasing companies are American, and the job growth tends to move south of the border, or offshore. In addition, it moves intellectual property and innovation, launched in Canada, into U.S. corporations. How can we improve access to capital for startups? Government funding is only part of the answer. We need to unlock more private capital to create a truly thriving startup ecosystem. For Canadian startup companies, research from National Angel Capital Organization (NACO) shows that angel investing (private high net worth individual investment) provides up to 90 per cent of the capital from prototype to go-to-market. Initiatives such as funding angel groups, which is done in Ontario and Quebec, putting in place capital gains incentives for investment in early-stage Canadian companies, or offering tax credits for angel investments as is done in B.C., helps to unlock private capital for this purpose. For example, Capital Angel Network in Ottawa (CAN) is funded by FedDev (part of the ISED Federal portfolio) and AIO (an Ontario provincial organization to foster angel investing). This funding covers operational costs to organize Ottawa angels into an investment group; the angels have then provided millions in funding, investing on average in nine new startups a year. Today, NACO research shows that $100 million is invested by angels every year in Canada. With a well-structured and supported angel network across Canada, a lot more capital could be funnelled into the seed stage. But funding the growth stage of Canadian start-ups needs more capital than angels can provide. If we don’t want our startups to sell at this stage, one option is to unlock the profits sitting in Canadian corporations through corporate venture tax credits. This would encourage corporations to invest in VC funds, putting a shot of adrenalin into the Canadian VC market. Creating clusters of innovation can also bring in funding. There are a few factors at work in clusters. Money from successful companies flows into new startups in the region and having multiple companies in a region creates a buzz that draws investment. Finally, talent is naturally drawn to the region by the prospect of jobs and growth. Clusters work best when there are anchor companies and universities in the region to build around. Canada has recently announced a supercluster initiative to help regions that have the basic building blocks to grow. Through this initiative, industry-led consortia will be co-funded to help jump-start the growth. Silicon Valley is the world’s best example of an innovation cluster, albeit a fairly unique one in its scale and enduring success. On a smaller scale, this was the effect in the ’80s and ’90s when Ottawa was a telecom centre. The success of Mitel, Nortel and Newbridge spawned many other startups and brought Canadian and American VCs and talent to the region. In addition, many of Ottawa’s early angel investors came from those companies and have helped to fund and grow others in the region. As Canada looks to increase innovation capabilities, the second area we need to focus on is talent. Projections indicate talent shortages in technology. There are a few factors at play. 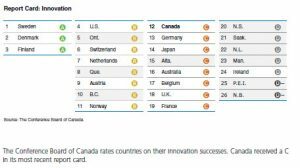 On the Global Innovation Index, Canada ranks 64th on investment per pupil. The top 10 innovative countries’ average rank is 33. While we have some top-tier universities such as the University of Waterloo, University of Toronto, McGill and UBC, we need to reinforce our educational capabilities and research base. Perhaps more important, we need to draw on 100 per cent of our population for innovation and technology skills. Currently only about 20 per cent of students studying in technology fields are female and the vast majority of company founders are male. To grow and thrive, we need to be pulling the brightest and the best from across the country. To attract more women into the field, we need to do more in our public and high schools to show the opportunity that exists and that they can be successful in these areas. Technovation is a great example of a program that aims to address this gap. It is a global program started in California that teaches girls mobile app development and entrepreneurship. More than 600 girls in Canada completed the program in 2017. The program has a mentorship aspect that brings women who have chosen technology careers together with the girls, which provides role models to inspire them. Through this, and programs like it, girls learn the power that technology has to change the world, and that they can be leaders and founders in that change. In addition to attracting women into the technology sector, Canada needs to get better at retaining and promoting women. There are a growing number of organizations, such as Women in Communications and Technology, that are working to provide the networking and mentorship that have been shown to help women stay in the field. Engaging youth in coding is critical to closing the skills gap. Coding is not a fringe activity; it is a driver of Canadian innovation and growth. Software is a key component in every sector of innovation and this should be a core skill that we develop in our youth. Enrolment in these fields in university has not increased at the rate that we require to support our innovation goals. British Columbia has recently made computer science a mandatory part of the school curriculum. This should be done across Canada. The federal government has also introduced a new CanCode initiative over the next two years to significantly increase the number of children exposed to coding. Following the CanCode initiative, we need to have sustainable, integrated learning in schools across the country. The second step on talent is attracting and retaining skilled workers in Canada. As we are growing the innovation economy, many of the opportunities are in smaller early-stage companies. Compensation programs such as option grants, and favourable treatment of capital gains are key for these companies to be able to compete for talent and funding. Immigration policy is also a critical factor in bringing the best and the brightest globally to work in Canada’s innovation economy. There are many bright spots in Canada’s innovation landscape. We have leading software companies such as Shopify, Hootsuite and Slack. We have a growing cleantech industry, with 11 companies on the Global 100 Cleantech list, compiled by the San Francisco-based Cleantech Group. We have top-100 globally ranked universities for computer science. The building blocks are in place for Canada to become a world leader in innovation. With key initiatives to improve the flow of capital and increase the talent pool, such as creating innovation clusters, introducing more youth to coding and using public funding to stimulate private investment, we can achieve our goals of growth. Jennifer Francis is board chairwoman of the Capital Angel Network, a principal at Café Noir Consulting and a high-tech mentor, adviser and investor.